Ahead of the first state visit to the United States by Chinese President Xi Jinping this month, a new poll finds a majority of Americans troubled by the size of U.S. debt held by China and the perception that China benefits from U.S. job losses. Not far behind are concerns over China’s involvement in cyberattacks and its growing military power. The Pew Research Center’s poll of 1,003 Americans, conducted between April 13 and May 3 indicates that, despite China’s slowing economy, a majority of those surveyed view China as an economic threat. Eighty-nine percent say they take the amount of U.S. debt, $1.27 trillion, held by China somewhat or very seriously. An equal percentage believes China benefits from the loss of U.S. jobs. About half (52 percent) consider China’s trade surplus with the United States, $31.2 billion as of July, a very serious problem. University of Chicago Chinese specialist Dali Yang said the survey is further evidence of long running negative views held by Americans of China. "So, this is actually not unusual. In many ways, it’s still business as usual except some issues are new, especially the cyberattacks. Overall, since 1989, public opinions of Americans about China have been reasonably negative and that has been going on for more than two decades now," said Yang. But, Dali Yang pointed out, the number of Americans who view China favorably in the poll actually increased slightly from 35 percent to 38 percent. He thinks the survey reveals that Americans, although currently enjoying a relatively low unemployment rate, still look back to the days when many jobs left for China. "And, they (the Americans) think, ‘ah, China is the place where all the jobs have gone.’ The irony is that China is actually losing jobs to other developing countries nowadays because living costs and labor costs have risen in China," said Yang. As for the debt, Dali Yang said, China is actually putting its trust in the United States to manage its debt and the Chinese, he added, still view America as the land of opportunity. The Pew survey reveals that even though economic issues continue to shape much of American public opinion about China, there is slightly less concern about these perceived threats than there was three years ago. 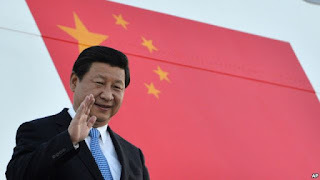 On security matters, Ankit Panda, associate editor of the Asia/Pacific current events publication The Diplomat, expresses surprise that only about two-thirds of those questioned viewed tensions between mainland China and Taiwan as very serious or serious. "Taiwan is the primary war-fighting scenario that the PLA (People’s Liberation Army) sees for itself. In fact, the most likely conflict China might be involved in the near future, in my opinion, [is] over the Taiwan Strait. Yet, Americans seem not to be concerned over that," said Panda. He said that will be a matter of concern among the people of Taiwan, especially policymakers. The survey was released as Taiwan conducted week-long military drills designed to repel a Chinese invasion of the island. The Pew survey was conducted before revelations in June that the Office of Personnel Management (OPM), which holds personal information on millions of current and retired U.S. federal workers, had been targeted by cyberattacks suspected to have originated in China. Fifty-four percent of those asked viewed cyberattacks from China as a very serious problem. Panda said he expects that number to increase in future surveys. "We’ve already seen several US businesses, primarily in the technology sector, meet with the Obama Administration to express their concerns about Chinese cybersecurity threats, and I think after the hack earlier this year at the Office of Personnel Management, which is unprecedented in its scale, I think we will also see the cyberattack issue become more prevalent in how Americans perceive the Chinese threat," said Panda. Roughly half of the respondents expressed concern over China’s human rights record, its environmental impact and growing military power. China has already become an issue in the 2016 U.S. presidential contest with Republicans the most concerned about China. Seventy-seven percent of Republicans view U.S. debt held by China as a very serious problem compared with 60 percent of Democrats. Sixty-five percent of Republicans see cyberattacks from China as a very serious problem compared with 49 percent of Democrats. However, Democrats remain concerned about human rights in China and its impact on the environment. The survey found that negative assessments of China are more prevalent among older Americans, aged 50 and up, while just 39 percent hold this view among those under the age of 30. Facing a wave of strong dissent from their conservative rank-and-file members, House Republican leaders now have changed their strategy on holding a vote of disapproval on the Iran nuclear deal, which was expected Friday. Despite all the wrangling, Republicans in the House cannot prevent the deal from being implemented, but some are hoping to delay the process. Republican lawmakers who left a special meeting with their leaders late Wednesday afternoon told reporters that instead of a single vote, the House most likely would hold three separate votes by Friday on the international deal to curb Iran’s nuclear program. The details have not been finalized, but members said one vote would be a resolution to approve the Iran nuclear deal, instead of a message to disapprove it, which the Senate is set to vote on. Some Republicans say this would force Democrats to go on record as supporting the deal or force them to publicly break with President Barack Obama. The president lobbied hard for the deal, which members of his administration spent 18 months negotiating. Reports said a second vote would be on preventing the United States from lifting sanctions on Iran as part of complying with the deal. It is not clear the Senate would take up the measure. A third vote would be a nonbinding measure to express a sense of the House that the Obama administration failed to fully inform Congress of the details of a deal because members have not been able to see the texts of side deals. Members of the conservative House Freedom Caucus triggered the shake-up. They demanded the Obama administration send the two side deals between Iran and the International Atomic Energy Agency to Congress as part of the deal under consideration. They argue the clock on a congressional review of the deal will not start ticking until the side deals are submitted. But under legislation approved earlier this year in the Senate, Congress has 60 days to review the deal before the White House can begin lifting sanctions on Tehran as part of the nuclear deal. That time period expires September 17. Both the House and Senate originally were expected to hold votes on a resolution of disapproval of the deal before that date. Republican House Speaker John Boehner of Ohio said Wednesday that Obama lost most members of Congress and the American people when he allowed Iran to continue on the path toward acquiring a nuclear weapon. Boehner has faced repeated revolts by conservative members of his party in the past on a number of issues. One such revolt, which tied a spending measure to the president’s health care reform plan, led to a 16-day partial government shutdown in October 2013. This internal drama over the Iran nuclear deal was unexpected because Republicans are united against it. On the Senate side, debate on the Iran nuclear deal disapproval resolution continues. Senate Democrats have secured 42 votes in support of the deal, one more than needed to block a disapproval vote in the Senate. Senate leaders have not yet announced how and when a vote will take place, but the 42 votes in the Senate mean Obama is not likely to have to use his presidential veto to ensure he can implement the international deal with Iran starting September 17. While the fate of the nuclear pact is no longer in doubt, presidential contenders and lawmakers of both parties spoke about it across Washington, airing arguments sure to echo in U.S. elections next year. Tea party Republicans showed up to hear Senator Ted Cruz of Texas and businessman Donald Trump, both presidential candidates who have condemned the accord. Some people traveled from as far away as Texas to attend the rally. The pact "gives [Iran] $150 billion to build nuclear weapons and intercontinental ballistic missiles to shoot — that’s about the dumbest thing you can do that I can think of,” said attendee Charles Anderson. But across town, another voice in the presidential fray stood up for the nuclear deal. Debate continued inside the Capitol as well. “Many Republicans opposed this agreement before they read it. Senator Cruz opposed it within an hour of its announcement,” said Senator Chris Murphy, a Democrat from Connecticut. The Iran accord also has prompted a pledge in the Republican presidential contest: “Any commander-in-chief worthy of defending this nation should be prepared to stand up on January 20, 2017, and rip to shreds this catastrophic deal,” Cruz said to rally attendees. Authorities in New York are investigating an incident involving retired U.S. tennis player James Blake, who says he was thrown to the ground and handcuffed by police while being mistaken for a suspect in a crime. Blake, who is in New York to attend the U.S. Open, told the New York Daily News he was standing outside the Grand Hyatt Hotel in midtown Manhattan Wednesday when a plainclothes police officer tackled him and told him to roll facedown on the ground. “To me it’s as simple as unnecessary police force, no matter what my race is," Blake, whose mother is white and whose father was black, told The Daily News. "In my mind there’s probably a race factor involved, but no matter what, there’s no reason for anybody to do that to anybody." The Daily News said Blake was released after a retired police officer recognized him and identified him to the arresting officers. Blake said he then told the officers to check his identification and credentials for the U.S. Open, which were in his pockets. Police, who were conducting a sting on a credit card fraud ring, say a cooperating witness mistakenly identified Blake as a participant in the scheme. At least one other person in the vicinity was taken into custody. New York Police Commissioner William Bratton told reporters that Blake "has a right to be upset about it." He said he will not tolerate any excessive use of force in his department. A police spokesman later said an officer is being placed on "modified assignment" after video of the incident was examined. Of Blake, he said, "The bottom line is, they got the wrong guy." Blake said he spoke out publicly to call attention to excessive use of force by police. He said he would like an apology from the department. 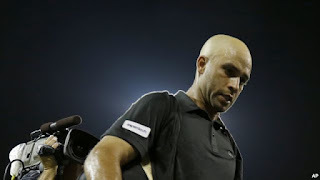 Blake, 35, is attending the U.S. Open tennis tournament, making appearances for corporate sponsors. He rose to number 4 in the world and won 10 singles titles before retiring in 2013.